Number 5 Type Collection: Congrats to Damon Rutherford (a.k.a., Ervin Santana)! Congrats to Damon Rutherford (a.k.a., Ervin Santana)! On July 27, 2011, Anaheim's Ervin Santana struck out 10 Indians in a 3-1, no-hit win over Cleveland. He allowed a single run in the first on a wild pitch, but bupkus afterwards. Amazing work! 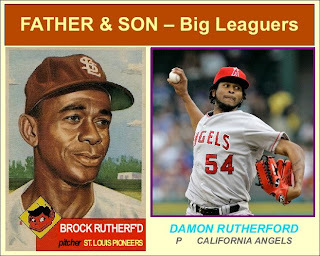 Ervin's name stands out to me because he played the role of "Damon Rutherford" on a custom card contest early last year, matched Satchel Paige for this 1976-style father-son card. I like how this card turned out, both for its double vintage look (1953, 1976) and unusual colors (Paige's brown cap, Santana's orange glove). 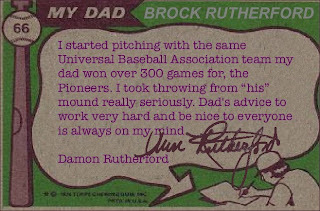 1976 father-son card backs included a vignette; most passed along important advice or described a pivotal moment in their careers when dad "came through." Find the original #66 (Gus and Buddy Bell) at Project Baseball 1976.